Imagine how boring life would be if you had it all, riches, political power and a high social standing. What would you do to make life interesting? Maybe see how fast you could lose everything? That’s the idea behind The Prodigals Club. What is The Prodigals Club like? 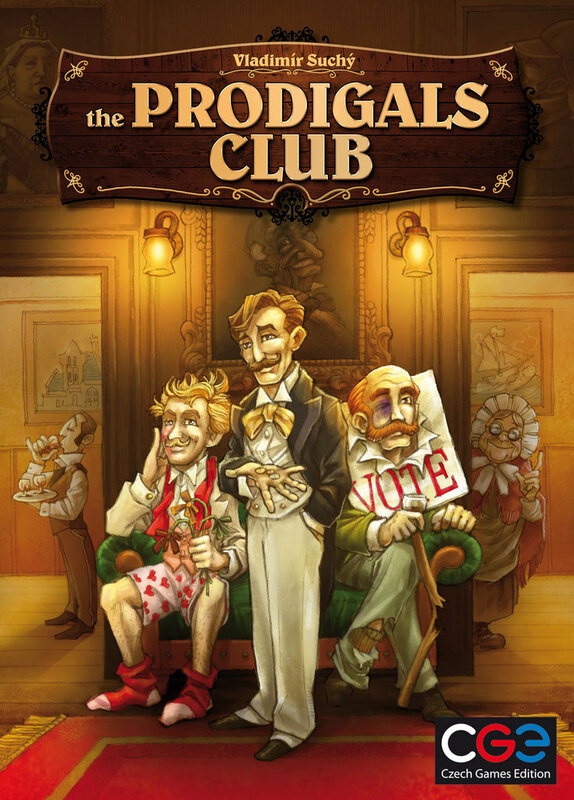 In The Prodigals Club you take on the role of an English Victorian gentleman. Rich and influential in society as well as politics, everything is going great… But you are about to change that. Because the goal of the game is to lose it all… your riches, your votes and your standing in society. So in this game you aren’t starting with nothing and trying to get the most of something before the game ends, in this game you start out with a lot of stuff and trying to get rid of as much as it as possible. The Prodigals Club has 3 modules, called competitions. These are Possessions, Election and Society. In a normal game you’ll play with only two of the three, but you can play with all three if you are up for a longer more complex game. Each competition is its own little “mini” game, but based on the two chosen competitions you prepare different decks of cards. There will be a deck of cards for each competition, but they will contain cards that will synergize and interact with each other competition as well. Once the game has been set-up (which does take some time), it plays as a pretty straight forward worker-placement game, so each player takes turns placing a worker (an errand boy in this case, represented by a top-hat). All the different competitions have different rules, so in a sense you have to understand and play two (or three) different games, but common for them all is that you want to get as close to “0” of everything, because at the end of the game your highest score in any of the competitions will be your final score, and you need the lowest score to win. I enjoyed playing The Prodigals Club. It’s whimsical and it’s very interesting to play something where it isn’t about getting the most of something, and love that you need to balance “losing” in every competition of win. I really like that you only play with two of the three modules, it adds a lot of replay-ability to the game, but at the same time it also adds a little extra frustration setting it up and teaching the rules of the different modules to players. But once you know how the game works it really is a lot of fun to play. The rules can be a little hard to grasp, but once you start playing, it all makes a lot more sense. It’s not a game I would recommend to everyone, but if don’t mind investing a little extra time in playing the game to get to know it well, and if you like the whimsical theme of it, then I highly recommend it. The more I play this game the more I like it, and I’m looking forward to playing it again soon. The overall idea and theme of the game is great. You start with a certain amount of possessions, votes, social standings and need to get rid of most of it to win. It’s great to do things opposite of most other games. The cards you play really add to the feel of the game. The overall mechanics of how you manipulate the different tracks can feel a bit abstract and for a lack of a better word, mechanical. The game looks very nice indeed. The graphics on the boards are clear and colourful and everything looks nicely polished. The art on the cards pushes this to the next level, with absurd and funny illustrations that really nail down the theme of the game. Overall the quality of the game is very well done. Czech Games Edition always make high quality games, and this is no exception. Nice thick cardboard pieces, good quality and a well written rulebook. While the game is not overly complicated once you start playing it, reading the rules for the three different competitions can be a bit daunting for some (it feels like learning 3 different games all at once). There are many things to consider each turn and a lot to understand.